Aaron Donald is reputed to be one of the most feared players in the National Football League. According to his colleague, Russell Wilson, Donald is the best defensive player he has ever played against, he described him as having a very strong ability to create pressure on the field. Little wonder why Pro Football Focus named him as the NFL’s best pass rusher and their No. 1 player in 2017. The defensive end played for the University of Pittsburgh before he was drafted by the St. Louis Rams in the 2014 NFL Draft. Find out more about him below. The player whose middle name is Charles was born on May 23, 1991, in Pittsburgh, Pennsylvania. His journey to becoming a football player started from when he was a child. Then, he played the sport with his peers for fun but on getting to Penn Hills High School, he took football more seriously, joining the school’s football team under coach Andrew Slome. Aaron made it to the first team All-State Class AAAA in his junior and senior years and recorded 63 tackles, 15 tackles for loss, and 11 sacks as a senior. At the end of high school, Rivals.com projected him to be a three-star prospect and also rated him as the 37th best defensive tackle in the nation. He received scholarship offers from four universities but choose to play for his hometown school, Pittsburgh. During his freshman year, he played 13 games as a reserve defensive end. The following year, he moved into the starting lineup and was named a second-team All-Big East selection. His junior season was very productive as he won first-team All-Big East honors and by his senior year, Aaron Donald was a force to reckon with, becoming one of the most productive defensive players in the NCAA. He eventually won the ACC Defensive Player of the Year and was a unanimous All-American. Ready to become a professional player, Aaron attended the 2014 NFL Combine and wowed everyone with his performance. He broke Tank Johnson’s record for fastest 40-yard dash time for a defensive tackle and was later selected in the first round of that year’s NFL draft by the St. Louis Rams with the 13th overall pick. The Rams subsequently signed him to a fully guaranteed four-year rookie deal worth $10.13 million. In his over five seasons of playing in the NFL, Donald has made a career earning of $51.09. He made $3.23M in 2017 but his $8.89 million cap hit for 2018 which ranks 6th on the Los Angeles Rams’ active roster, has placed him very highly in the NFL. 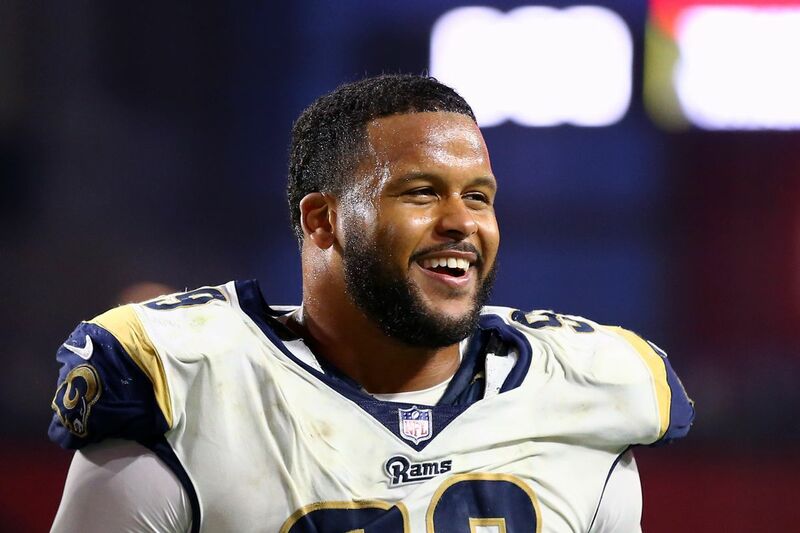 In August 2018, the Rams announced a lucrative extension for Aaron Donald, a six-year, $135 million contract, including a $40,000,000 signing bonus, $86,892,000 guaranteed, and an average yearly salary of $22.5 million which overshadows the $19.1 million average that Von Miller made from the Broncos in 2016. This current salary makes Donald not just the highest paid defensive player ever but also puts him in the grade that only elite quarterbacks have gotten to. He is now the 10th highest-paid player in the NFL salary-wise, behind nine quarterbacks. In 2018, Aaron Donald’s base salary was $892,000 while his signing bonus was be $40 million. He’ also had a cap hit of $8,892,000 and a dead cap hit of $50 million. 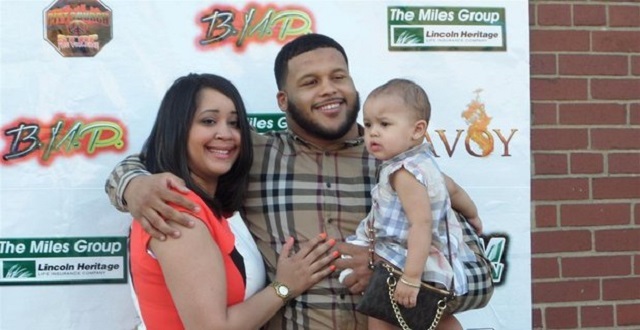 Aaron Donald is the son of Archie Donald (father ) and Anita Goggins (mother). He has two siblings – Akita (sister) and brother Archie, who played football at Toledo. They were all raised in Pittsburgh and this made the family natural supporters of the Steelers. However, his dream of being a professional football player moved him to the St. Louis Rams with his family standing solidly behind him each time he plays with the team. The player’s family is no doubt a close-knit one. After Aaron won the Rookie of the Year award in 2014, he decided to put a smile on his father’s face by buying him a truck. The very proud dad could not hold back his excitement as he was seen in a video throwing punches in the air with a heart-warming smile all over his face. Although the former University of Pittsburgh player is yet to tie the knot, we believe he will do just that when the time is right, hopefully, with his girlfriend, Jaelynn Blakey, who already has two children for him. Jaelyn just like her man was born in Pittsburgh, Pennsylvania, and they attended the same Penn Hills High School from where she graduated in 2010. The couple met and fell in love in high school and have been together since then. They welcomed their first child, a beautiful daughter named Jaeda, in April 2013 and Aaron Jr. arrived three years later on April 6, 2016. The Los Angeles Rams defensive end possesses an uncommon combination of size, speed, and strength which makes it possible for him to terrorize opponents anywhere on the defensive line. He stands at a decent 6 feet 1 inch (1.85 m) and weighs 280 lb (127 kg). Aaron Donald has obviously shed some weight since he got into the NFL as his pre-draft record shows that he weighed in at 285 lb (129 kg). The talented player has an arm length of 32 5⁄8 inches (0.83 m) and hands which are measure 9 7⁄8 inches (0.25 m) in size.